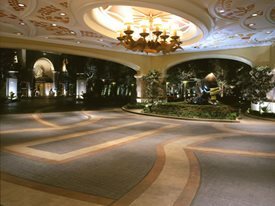 Decorative concrete in the porte cochere at Wynn Las Vegas showcases the luxury of this 5 star hotel. Photo ArCon Flooring - Gregg Photography. Upon arrival, visitors to the Wynn Las Vegas hotel and casino step out of their cars onto what looks like brownstone insets between large slabs of limestone. 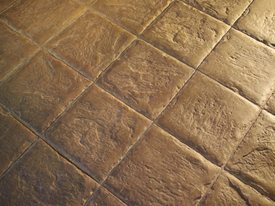 The first impression of old world charm and antiquity has been created using durable stamped concrete. These areas have been beautifully colored and finished to look nothing like concrete. 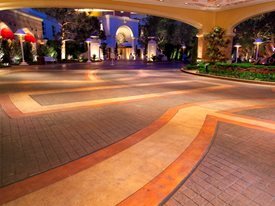 ArCon used integrally colored concrete, color hardeners and colored release agents to achieve the classic style required for the Wynn porte cochere. Photo courtesy Solomon Colors. The appointments and materials throughout the Wynn Las Vegas are of the finest quality befitting a five star hotel, which at its opening was reputedly the most luxurious hotel in the world. The developer and a famed team of designers specified precise color selections to evoke specific moods - installed on the tightest timelines using the most durable materials available for vehicular and pedestrian traffic. Concrete met all these criteria and achieved the highest aesthetic standard in the hands of the experienced specialty contractors, ArCon Flooring. The porte cochere (a term meaning "carriage porch" or a large covered drive-through area where vehicles pass through to allow passengers to access a building entry) was designed to be reminiscent of the grand resorts and villas of Switzerland and Tuscany, but hand-cut stone and tile can be a nightmare to install on fast-track construction schedules. It can also require significant maintenance to achieve a degree of flatness that mitigates risk. On the other hand, decorative concrete not only is easy to clean and maintain, but installation can be expedited. Samples can be produced to eliminate guesswork, and provide very tight color-matching. A custom color was used to replicate the look of brownstone. Photo courtesy Solomon Colors. According to Mark Balogh, president of ArCon Flooring, his company works with many different types of materials, but concrete is the most versatile. He said, "I have seen a situation where expensive imported tile and stone were purchased and discarded mid-project because installation was painstaking and time-consuming. Tile and stone may be beautiful, but concrete is beautiful, versatile and readily available locally - which is an environmental and cost consideration. It also provides the excellent long-term durability needed for Las Vegas properties. The porte cochere at the Wynn shows just how well stamped concrete works. All surfaces were sealed to reduce maintenance and it still looks fantastic three years later." Unique cement-based, rusticated terrazzo graces the exterior patio. Photo ArCon Flooring - Gregg Photographic. The elegant patio surrounds a firepit. 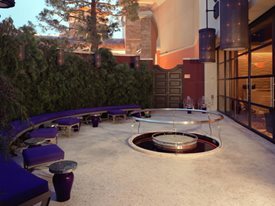 The designers wanted a look similar to the terrazzo that ArCon Flooring installed in restaurants and a spa inside the Wynn Las Vegas. However, epoxy terrazzo is not UV stable in exterior use and is sensitive to heat and thus not suited to withstand exposure to changing weather conditions. ArCon suggested using "rusticated terrazzo" which is an environmentally sound, cement-based material that is sufficiently durable for exterior use. 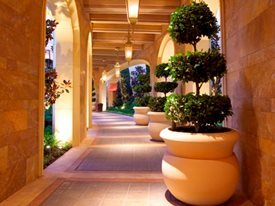 The use of exterior decorative concrete on walkways complements the luxurious architectural style of the Wynn Las Vegas. Photo courtesy Solomon Colors. For the patio, ArCon installed a 3/8- inch thick cementitious topping which was seeded with selected shades and sizes of glass and stone, then ground to a level surface. Samples were produced for color selection. It was reassuring to the developer that ArCon had used this technique in a different color scheme for the Fashion Show Mall which has demonstrated that rusticated terrazzo can endure very high foot traffic long term, and look good with minimal maintenance. Rusticated terrazzo may be expensive initially, but has long-term value or "good life-cycle costing" as proponents of green building would state it. "Building green has moved from being a trend to becoming an industry standard", said Keith Gibbs, Director of Marketing at Solomon Colors. "Decorative concrete manages to be earth-friendly while also improving the beauty of a project. Many decorative concrete treatments have a solar reflectance index that reduces heat island effects and can contribute to earning LEED points." When the $2.1 billion Wynn Las Vegas opened its doors in April 2005, boasting 2700 guest rooms and 22 bars and restaurants, it made headlines for reinventing the classic refinement of gracious luxury hotels of yesteryear with a unique international remix of styles and innovative use of materials. In harmony with the design approach of this five star resort, the decorative concrete hardscapes exemplify the perfect marriage of European elegance and American ingenuity in a location where the aesthetics and durability will last for decades to come.